Have leftover ham you don’t know what to do with? Check out these 15+ ways to use leftover ham that will have you looking forward to the leftovers! Ham makes for a great party or holiday gathering main dish. However, it’s pretty much inevitable that you’re going to have some ham leftovers that you’re wondering how to use. While you can easily freeze your ham to use within the next few months, you can also use it in a lot of dishes to change things up. Check out these 15 ways to use leftover ham. 1. Add it to your scrambled eggs or omelet for breakfast. I love a protein-packed breakfast of scrambled eggs with diced ham and a sprinkle of cheese. 2. Make hash. There’s just something warming about a hearty hash to start the day with, though I enjoy it for dinner, too. Besides, what’s not to love about a mix of fried potatoes, ham, onions and whatever else your stomach desires? 3. Use it in a pasta salad. Pasta salads are a great way to use up a variety of leftovers. 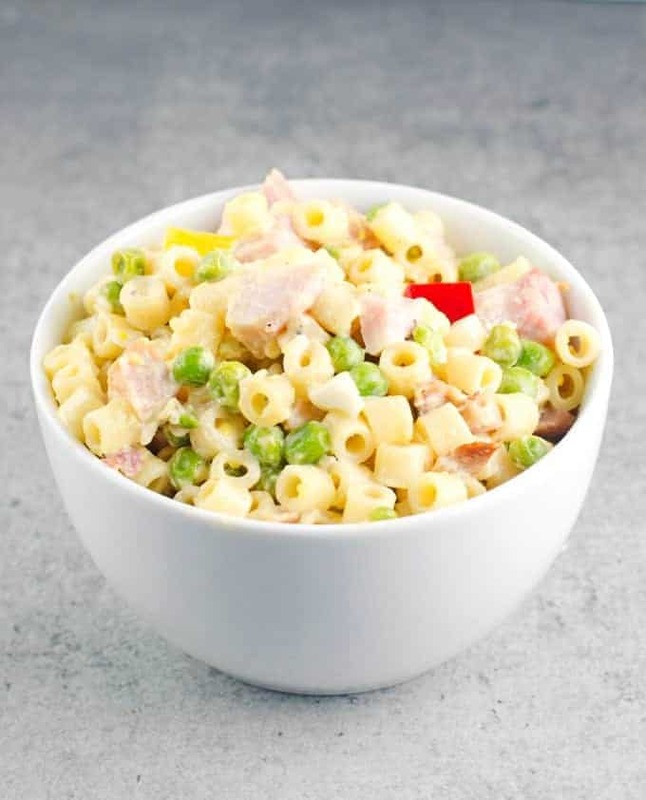 Check out our recipe for pasta salad with peas and ham for a delicious way to use leftover ham. 4. Use it as a topping for baked potatoes. Baked potatoes make for a quick low-mess dinner. Broccoli, cheese, and ham would be a great topping trio. 5. Add it to fettuccine alfredo. Who doesn’t love creamy alfredo sauce? Add in some frozen peas and diced ham for a complete meal. I so love the bit of saltiness the ham adds! 6. Make split pea soup. If you have ham with a leftover bone, making split pea soup is a perfect way to use it. I actually look forward to having a bone-in ham just to make this soup! Make sure you leave a little bit of meat on the bone and also some ham to add in. 7. Make a quiche or frittata. Quiche, which has a crust, and frittata, which does not have a crust, is the perfect dish to make when you’re trying to clean out the fridge. You can add all sorts of meats, veggies, and cheese and it’s a great meal to start or end the day with. Using ham instead of sausage in our mini frittatas recipe would be delicious! 8. Turn it into a sandwich. Using leftover ham in a sandwich is probably one of the most traditional ways to use up the leftovers. Instead of the same old ham and cheese, make a croissant sandwich, grilled ham and cheese, or even a Croque Monsieur. 9. Make a breakfast casserole. Ham and eggs are a classic combo for a reason – they’re darn good together! 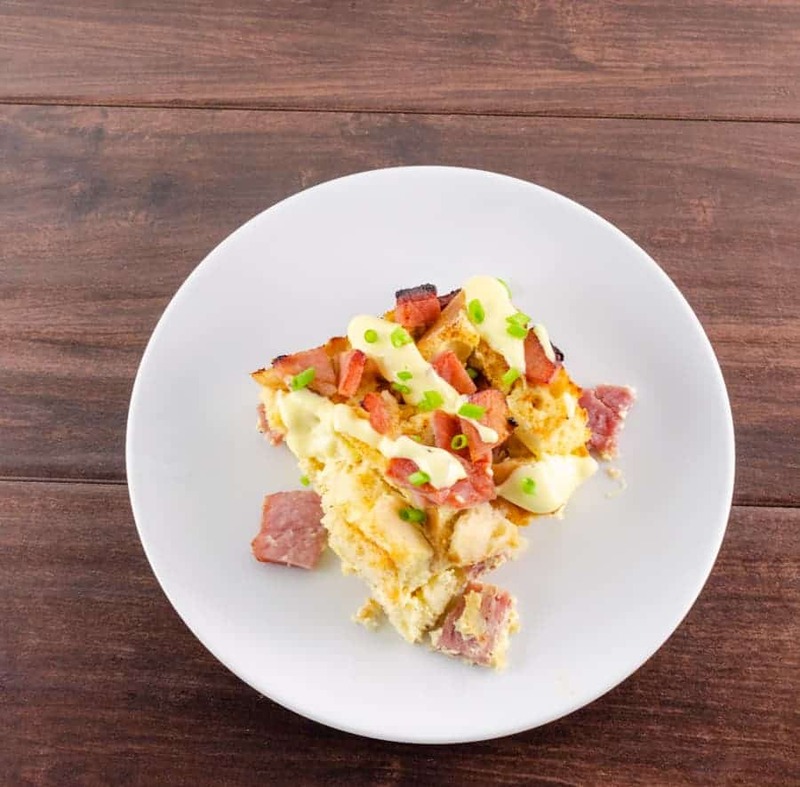 One of my favorite ways to use leftover ham is to put it in my delicious overnight eggs benedict casserole complete with homemade hollandaise sauce. If you have bread that is about to go stale, you can easily whip up a breakfast casserole and use ham as your protein. It also makes for a great breakfast for dinner meal. 10. Put it in scalloped potatoes. I love a scoop of rich cheesy scalloped potatoes with ham mixed in. Here’s my favorite recipe for cheesy scalloped potatoes. 11. Mac and cheese with ham. Turn mac and cheese from a tasty side dish to main dish star by adding in some diced ham. 11. Ham and swiss quesadillas. While ham and swiss sandwiches are yummy, turning them into ooey gooey warm quesadillas are even better! 13. Chicken Cordon Bleu – A classic dish using ham that is perfect to use those last remaining leftovers of ham. 14. Add it to a salad. During the weekday, most of my lunches consist of salad topped with a variety of veggies and whatever leftover protein we have in the fridge. Ham is one of my favorites to use in a salad with its slightly salty bite. 15. Use it as a pizza topping. There’s the classic Hawaiian style pizza of ham and pineapple, or ham pairs well with other meats and toppings like mushrooms and onions. 16. Make fried rice. Fried rice is another way I like using up random odds and ends in the fridge, plus it’s one of Mr. Savvy’s favorites. With leftover rice, cubed ham and a bag of mixed veggies, this meal goes together easily. 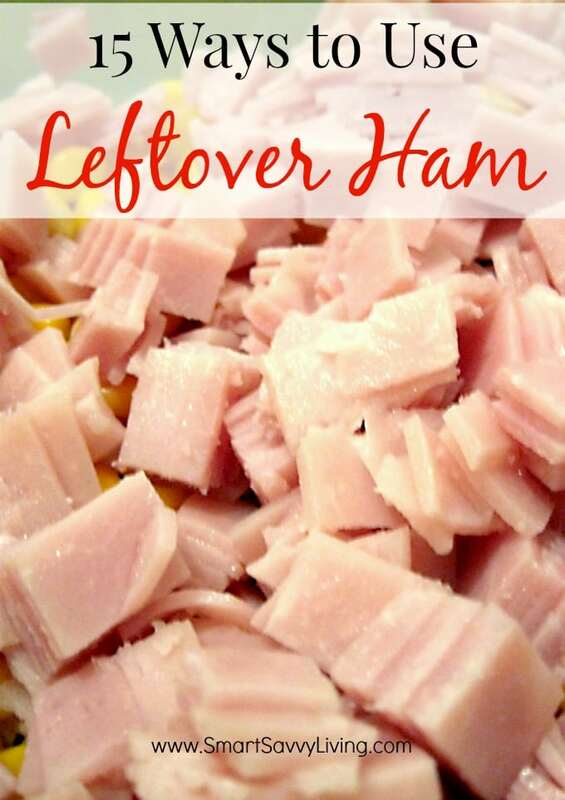 What are some of your favorite ways to use leftover ham? Love ham? Be sure to check out our brown sugar ham glaze recipe!